There is no doubt that science fiction is cool. But can all the lasers and phasers, robots and aliens, and starships and time machines be more than just simple entertainment? Can science fiction, with all of its technological wonders and “what if” scenarios, also be educational? Many moms and dads may not concur that the time their children are spending binge watching something like Lost in Space on Netflix is really helping them learn. Wouldn’t they be better off burying their noses in textbooks? Absolutely, yes... sometimes., But often, no, because not only is science fiction inherently educational, it also makes learning fun. That is one of the missions of the Museum of Science Fiction – to motivate learning in STEAM: science, technology, engineering, art, and math. But even more broadly than that, it is to inspire the imagination. Science fiction is rich with ideas that can serve as a springboard for curiosity and project-based learning, from understanding how warp drive might function to how cyborgs could affect our daily lives. The Museum believes science fiction holds value for all ages and endeavors to tailor its education and outreach efforts to appeal to a wide range of visitors in an inclusive environment. Escape Velocity offers different education stations where kids can explore a range of science, technology and math topics. Some examples include stop-motion animation and film workshops, writing workshops, and writing contests. The Museum has also partnered with innovative non-profits like Boolean Girl and Pongos Learning Lab to do coding workshops for kids. In the Exhibit Hall , the Museum offers different education stations where kids can explore a range of technologies like virtual reality or 3D printing. There are an array of art and technology workshops, and it shouldn't come as a surprise to anyone that NASA has a major presence at the event. At Escape Velocity 2019, the Museum will be working with The Great Adventure Lab to offer robotics and engineering workshops for the first time, and will offer new, tech-driven art and music workshops for kids as well. Bowie High School in El Paso Texas was one of the winners of the international CubeSat competition. The Museum, in partnership with NASA and Cornell University, announced the winners at the 2016 Escape Velocity. The Museum has initiated a new partnership with Titan Robotics, the robotics team at TC Williams High School in Alexandria, VA, and is excited to support their endeavors in the FIRST Robotics Competition and beyond. Students from the Titan team will be showcasing their robots at Escape Velocity in May. Afterward, with the Museum’s support, the team will seek to adapt their creations for practical civic implementation in the City of Alexandria. Connecting with area schools and educational groups is an important part of the Museum’s mission in coordinating Escape Velocity “We offer field trips to area schools and we are working on a merit badge program with the Boy Scouts and Girl Scouts,” said Sweeney. 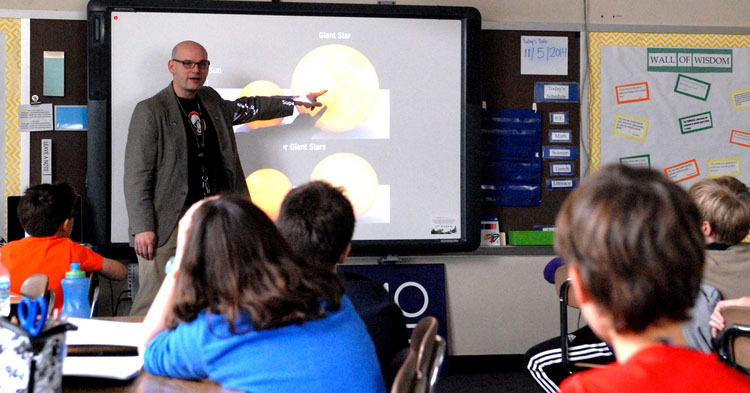 There’s also an educator’s workshop every year that aims to show educators how they can incorporate science fiction into their lesson plans for use in a variety of grade levels and classroom settings. In 2019, the Escape Velocity Educator’s Workshop will be presented by NASA’s Afterschool Universe, with astronomy lesson plans focused on the formation of elements in space and how we can identify those elements using light. The Museum also has partnerships with several universities and offers work study programs for students to gain valuable experience in their majors. Alex Young, PhD, from NASA Goddard connecting with area schools and educational groups furthering the Museum’s educational mission. And while Escape Velocity is an amazing event, the Museum doesn’t just shutter its virtual doors until the next year's convention. Instead, the Museum's dedicated team of staff members and volunteers search for other grassroots and educational outreach opportunities throughout the year. So, as cool as science fiction can be, it offers much more than fun ideas. It’s a way to think about the future. It challenges our understanding of the world through a synthesis of science and art that inspires us to learn about both along the way.